Croft Circuit, near Darlington, has issued an action-packed motor sport fixture list for 2012 with the star-studded Dunlop MSA British Touring Car Championship (23-24 June), its own historic racing festival, Nostalgia Weekend (4-5 August), and the Roger Albert Clark Rally on 24 November featuring the hero cars of rallying’s golden era from the Seventies among the major highlights. In all some 14 events spanning motorcycling and both car racing and rallying are scheduled for the year ahead at Croft, the North East region’s premier motor sport venue. Significantly the locally based and highly enthusiastic Darlington & District Motor, Northallerton Auto and North East Motor Cycle Racing clubs will all play significant roles, running some of their own championships at Croft as well as providing volunteer trackside marshals at many of the events. The visiting, award-winning British Automobile Racing Club (BARC) and Historic Sports Car Club (HSCC), two of the UK’s top organisers of motor sport events, will add a further touch of class in 2012. Croft will again also offer some of the very best value for money entertainment of any motor sport venue in the UK as it continues its policy of FREE ADMISSION for children aged under 16. The majority of its events will cost just £12 per adult with the most expensive race day ticket (BTCC) still only priced £24 if booked in advance (compare that to £60 for a Chelsea match). All admission includes access to the central race paddock which enables the public – including many children – to rub shoulders with the drivers and riders and enjoy a close-up look at their competition cars and motorbikes. Events begin with the DDMC’s traditional Jack Frost Rally in little more than a week’s time on Sunday 22 January – its competitive timed stages are held within the confines of the Croft venue. Notably, the DDMC’s Northern Sports & Saloon Car race championship which attracted capacity grids in 2011 will be ‘one to watch’ when it makes several appearances at Croft in 2012. However, the first racing action of the new season at Croft will be on two wheels with the opening rounds of the NEMCRC’s championships on the weekend of 31 March-1 April. All events will run on weekends with the exception of an exciting new addition for 2012 – the Tour Britannia on Thursday 7 June. Britain’s only classic race and rally tour – which draws inspiration from the old Tour of Britain held in the Seventies – includes a mixture of races and regularity tests as part of its three-day route. Predominantly for cars dated pre-1975 the entry will include many iconic makes and models, among them Porsche 911, Aston Martin DB2, Ford Mustang, Chevrolet Camaro, Shelby Cobra, Lotus Elan, Jaguar E-type and Ferrari 250GT and 308. The summer months bring a real carnival atmosphere to Croft and the region with the annual visit of the UK’s premier motor racing championship, the Dunlop MSA British Touring Car Championship (23-24 June), plus Croft’s own highly-acclaimed historic retro festival, Nostalgia Weekend (4-5 Aug). The BTCC’s high-profile will put Croft firmly in the spotlight with live national TV coverage of the event on the ITV4 channel. Notably, the event will offer enthusiasts their only chance to see the bumper-to-bumper BTCC with its spectacular new-look NGTC turbocharged cars in action in the region in 2012. Meanwhile the Nostalgia Weekend will once more provide the public with an opportunity to roll back the years thanks to its enchanting mix of races for historic saloon, single-seater and sportscars from the 50s-70s, off-track entertainment including a display of some 500 classic cars and motorbikes and a stunning line-up of WWII land and air machinery courtesy of Croft Military, plus retro lifestyle attractions featuring catering, fashion and music. After a successful return to Croft in 2011, the British Rallycross Championship – headlined by its mighty 500bhp supercars – is scheduled to re-appear on Sunday 28 October. Similarly after wowing the Croft crowds last month, the superb Roger Albert Clark Rally featuring many of the favourite cars that starred on the famous RAC Rallies of the Sixties and Seventies will be back on the slightly earlier date of Saturday 24 November. Prices shown above are on the day/on the gate prices – discounts are available for tickets purchased in advance for BTCC & Nostalgia only. Other ticketing options (weekend and grandstand) are also available. Admission prices for Tour Britannia on Thursday 7 June are £10 per adult and free for children aged under 16. 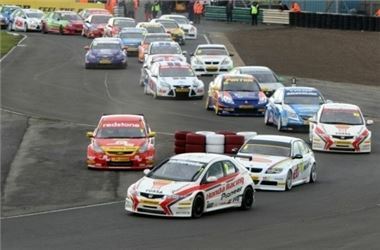 See official www.croftcircuit.co.uk website for full event details & ticket prices.